But there is great dignity in allowing oneself to keep clear about what is good, and it is what I think of when I hear the term “good taste.” Whether things were ever simpler than they are now, or better if they were, we can’t know. We do know that people have always found ways to eat and live well, whether on boiling water or bread or beans, and that some of our best eating hasn’t been our most foreign or expensive or elaborate, but quite plain and quite familiar. And knowing that is probably the best way to cook, and certainly the best way to live. I’ve always had a not-so-secret crush on sandwiches–on toast lavishly covered with peanut butter and jelly, on open-faced roast beef smothered in gravy and most definitely on the open-faced tartine, decorated with whatever happens to be happily on hand. 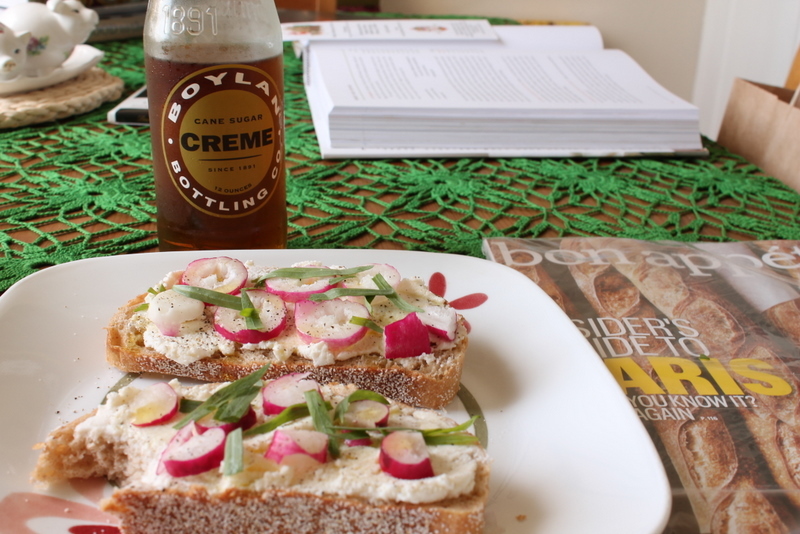 Recently, this obsession has manifested itself in ricotta and peppery French radishes, speckled with fresh tarragon and with a light drizzle of olive oil. If you put it in the oven, you’re in for a real treat when you open the door since the soft scent of licorice will greet you. But it’s equally good with some fresh bread, maybe even with a creme soda, a childhood weakness that I still give into every now and then. Depending on what you keep in your fridge or picked up at the market, you could have a different sandwich every day of the week and never get sick of them. A novel idea, right? After all, why spend roughly $6-$8 on a subpar sandwich when you could make something tastier at home? 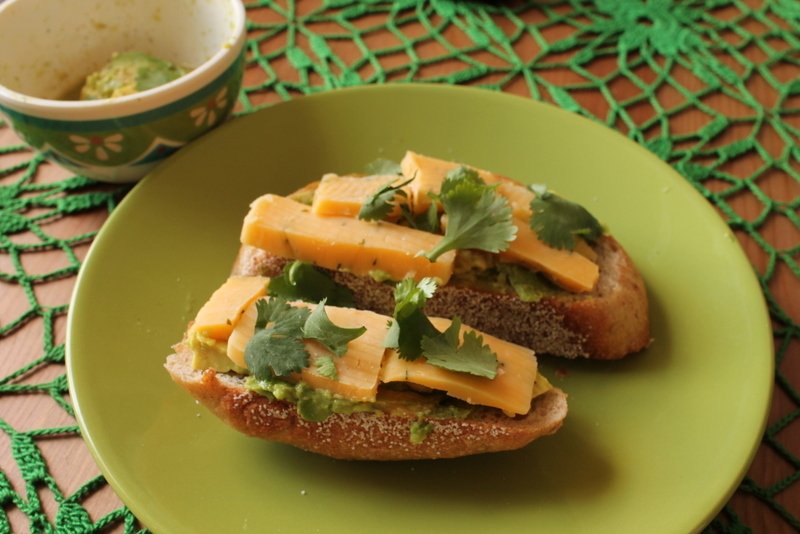 If I have avocado, I cover them with lime juice and then mash them; then I spread them on the bread like mayonnaise or mustard and top them with cheese (a Clawson Long Cotswold with chives and onions works wonderfully here). Some cilantro makes a nice accompaniment. I’ve also become obsessed with boiling eggs and eating them on toast. 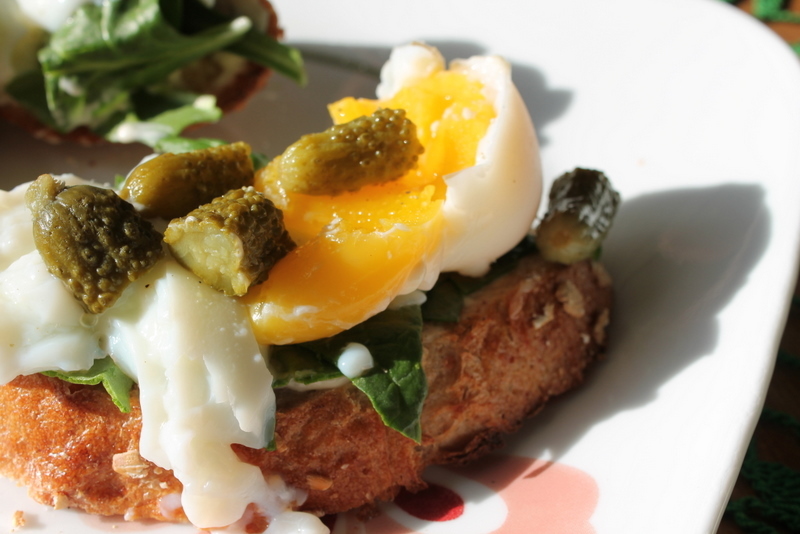 Such a sandwich calls for mayonnaise and herbs, spinach that is pleasantly weighed down by the egg and definitely some chopped pickles or cornichons (I eat pickles like they’re going out of style). 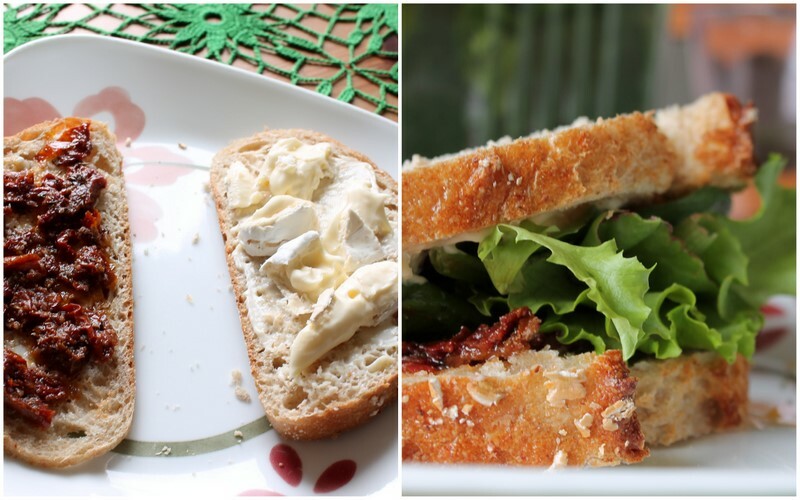 But an all-time favorite is definitely the sun-dried tomato (soaked in oil for flavor) and brie sandwich with a tad of mayo and some greens (baby spinach is best). There is a place on Addison Street in Berkeley where I used to buy this sandwich; it was a little farther than the average graduate student would walk for lunch, but I never felt like it was a wasted trip. Since I’m not on campus as often anymore, I’ve started making the sandwich at home. It’s a touch harder to eat this one as a tartine, however, so I stack it carefully and hope not to lose any of the flavorful innards along the way. This last sandwich was the product of a perhaps mildly fevered imagination. I’ve been a little under the weather recently and this past Saturday, I wanted to put something on my toast (I’ve been following the BRAT diet, as prescribed by my mother, a nurse: Bananas, Rice, Apple[sauce] and Toast) that wasn’t peanut butter, banana and honey. 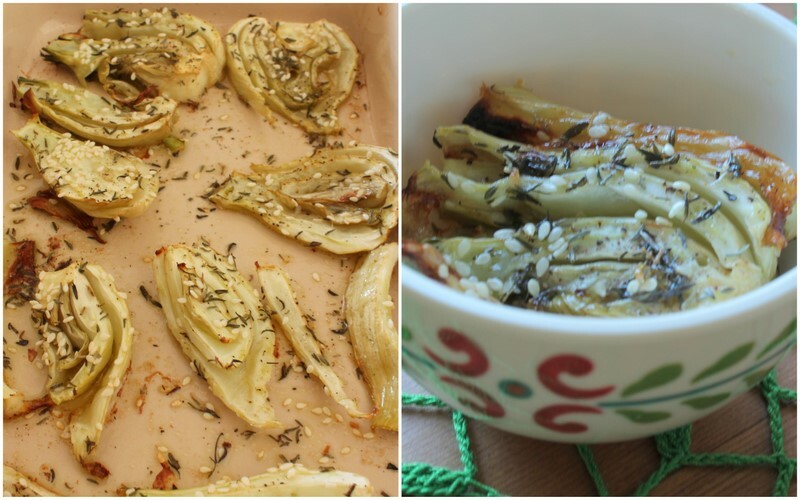 I had bought a beautiful fennel bulb with lots of feathery fennel fronds earlier in the week, thinking I would make a salad or braise it like last year, or maybe even repeat the Fennel-Campari cocktails that the Greek and I had enjoyed so much. 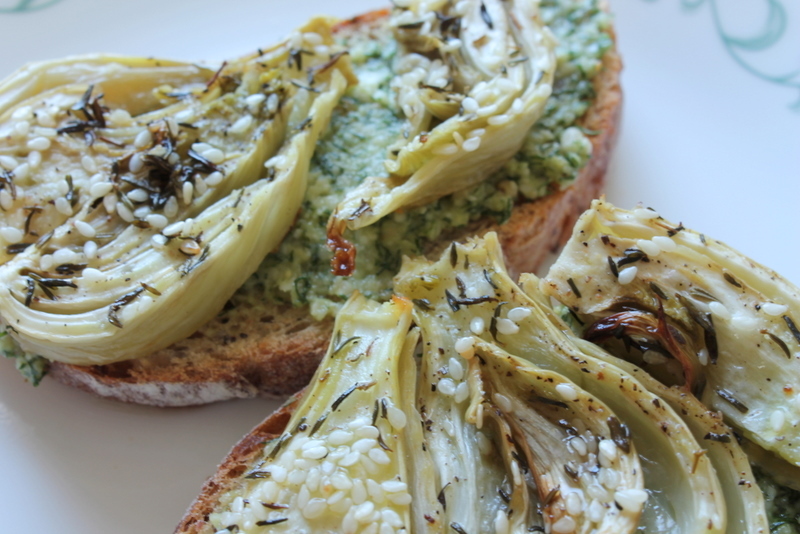 Since none of that was meant to be, I decided to turn the fronds into a fennel and feta pesto and to roast the bulb (for 40 minutes at 375) with sesame seeds (an odd, but crunchy and revelatory addition), dried thyme, olive oil and salt and pepper. You see, one thing I loved about the sandwiches I would get at a little cafe in Finland was that they would be topped with a red or green pesto instead of mayo or mustard. I decided to channel that spirit and to decorate these pesto sandwiches with roasted fennel (they are also good with a thin slice of feta and tomato, put under the broiler for a few minutes). Maybe that seems like a lot of work for an invalid, but the Greek was in D.C., I was all by my lonesome and, even when ill, I’m a horrible “rester.” I need to be doing things constantly. And is there any better use of one’s time than taking care of oneself by carefully preparing a satisfyingly easy meal? N.B. Since I was sick, I was a little heavy on the garlic, thinking of its nostril-clearing, medicinal powers. I would suggest that, for the healthy, you could cut back to 1 or even 1/2 clove, depending on your preferences of course. -Carefully rinse the fennel and let it dry, making sure to remove all the dirt from the bulb if you plan on roasting it as I did. 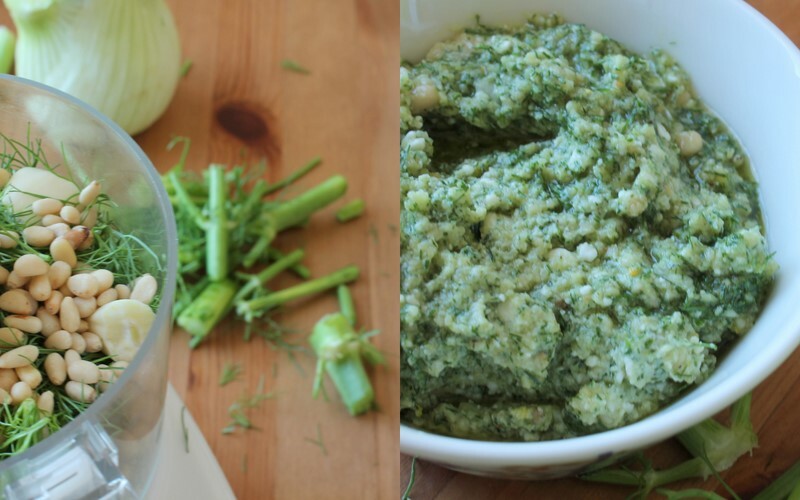 -Using kitchen scissors, cut the fronds and some stems from the bulb and add them to a food processor. -Add the garlic to the mixture and pulse until the fronds and garlic make a paste. -Now, add the feta and olive oil to the mix and pulse again. -I preferred that my pesto be a little thicker than the average pesto, especially since my goal was sandwich spread instead of pasta sauce. Next Article SF Bake Sale!